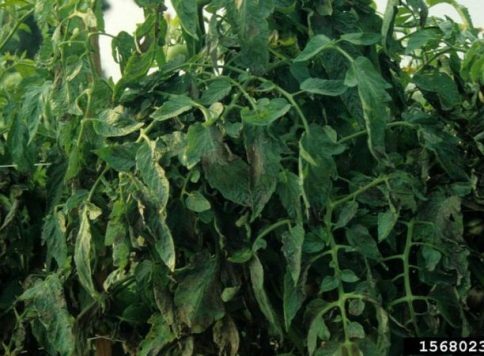 Late blight hosts include: potato and tomato. Responsible for Great Irish Famine in the mid-1800s. Classified as a water mold, not a fungus. 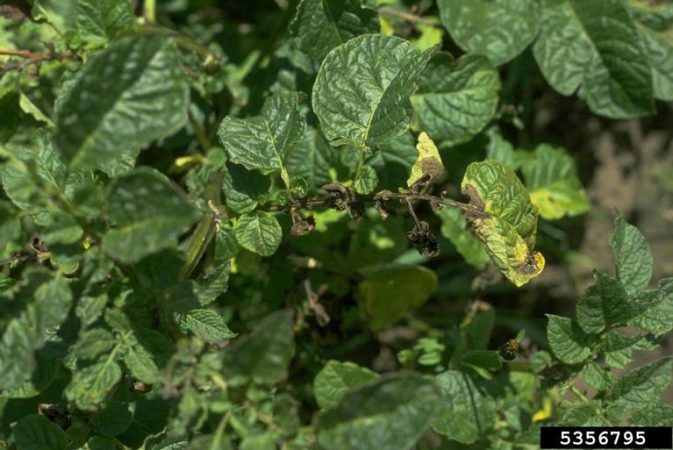 Appears on foliage as irregular brown or black spots on top of leaves and stems. Legions may be surrounded by light green halo. 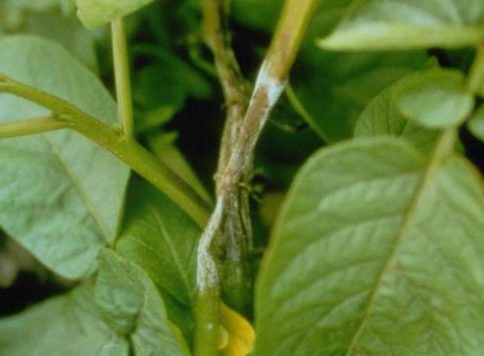 Bottoms of leaves have similar spotting overlain by thin, white, cottony growths containing spores. 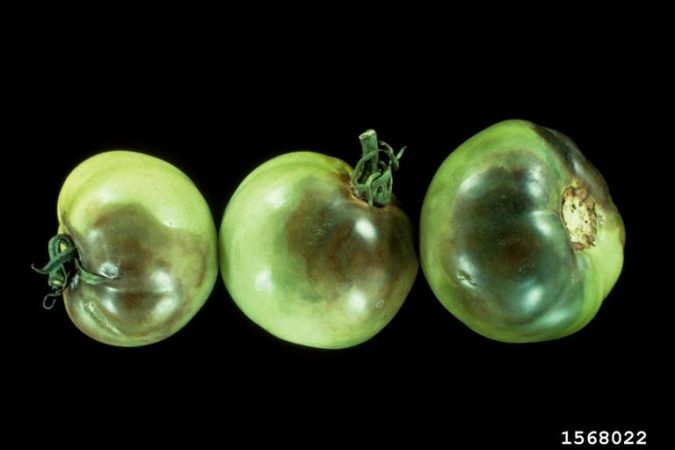 Infection on tubers appears as reddish-brown, brown, or purple discoloration. 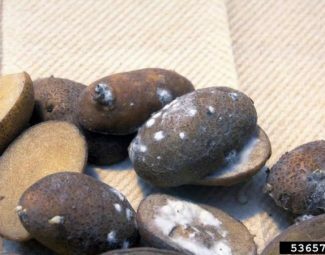 Infection causes tubers to be vulnerable to many other infections that lead to complete rotting and foul smell. 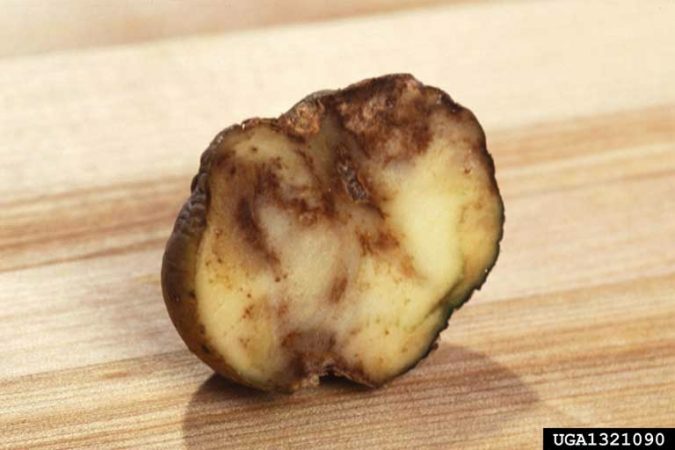 Inside the tuber, the initial infection will look dry and corky with a dark reddish-brown appearance. 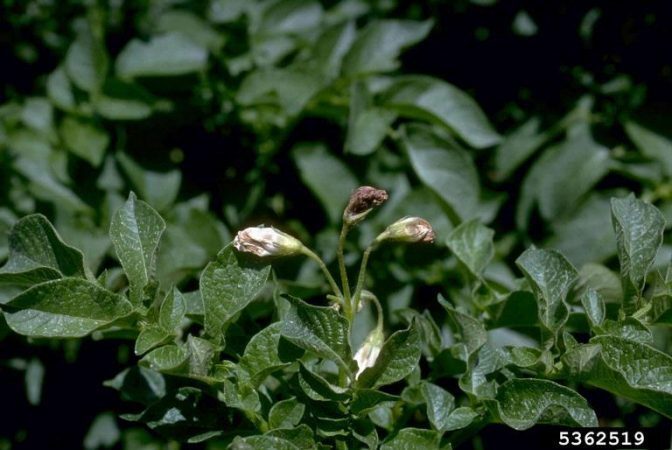 Has proven to be resistant since the 1980s to some previously efficacious chemical controls. Ideal conditions for development include temps of 60-80 F for 8-10 hours with high moisture and/or humidity. Weed hosts include nightshade and petunia. Spores produced on host foliage are carried by wind or water to other host plants. Under cool and wet conditions, spores release mobile reproductive units called zoospores that use a flagellated tail to find a suitable site for penetration and infection on host foliage. In warmer conditions, instead of releasing the zoospores, the spore will produce a tube that directly penetrates the host and provides nutrients directly to the zoospores still inside the spore. 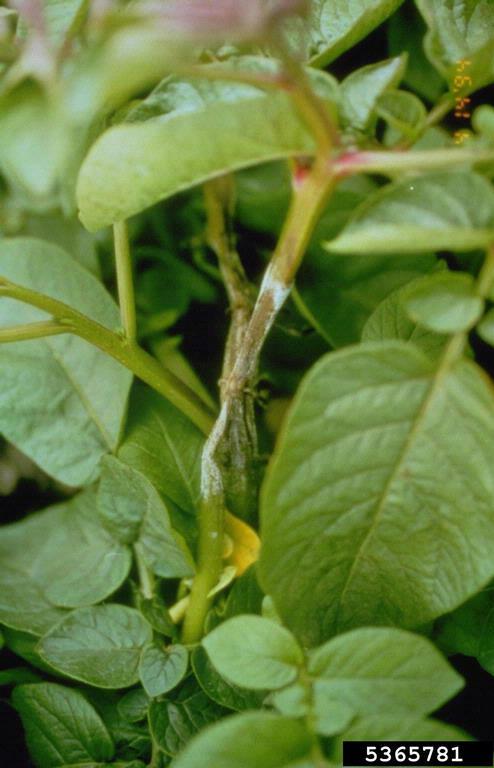 Sexual reproduction is possible if both mating types (A1 and A2) are present on the same host foliage. 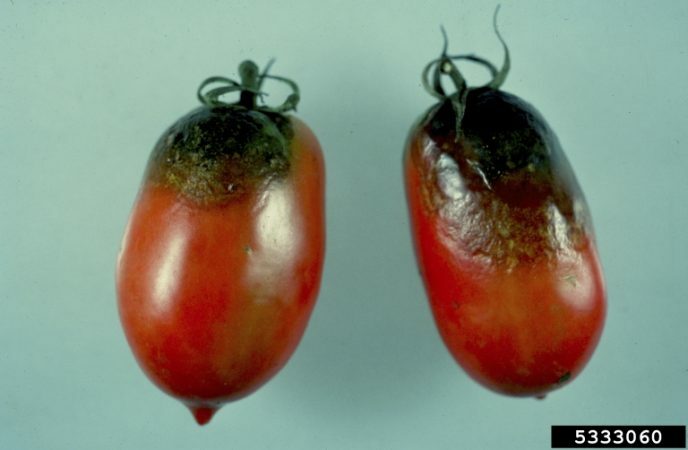 A1 and A2 nuclei fuse together to form sexually produced spores, which reproduce in the same way as asexual spores. Spores produce hyphae, which establish within the epidermal cells to feed on nutrients within the host. 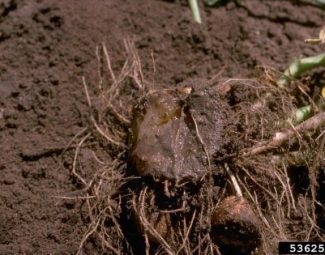 The presence of water is necessary for germination and host penetration. 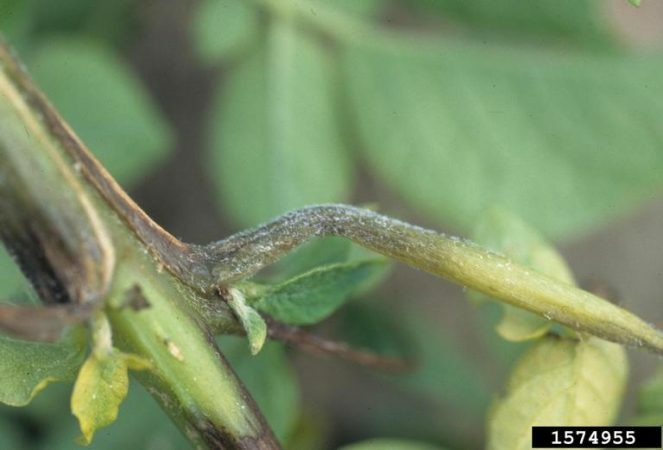 During wet and moderate temps., spores are produced underneath host leaf. 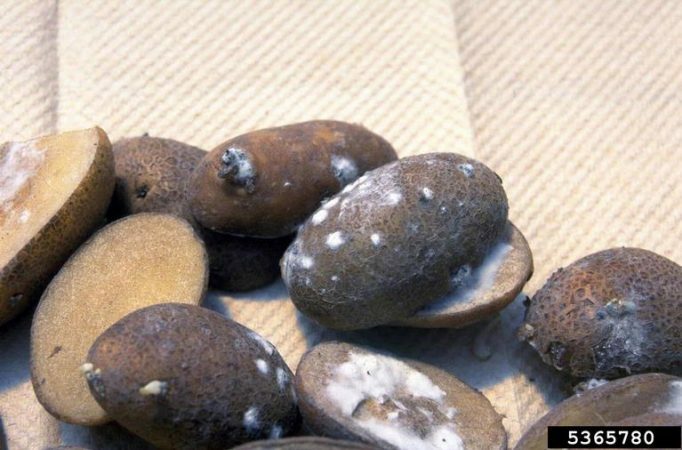 Spores washed from leaves by water infect soil dwelling tubers. 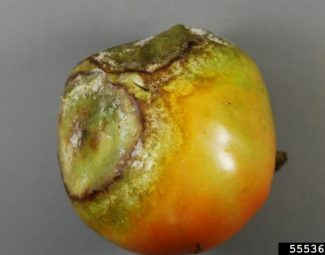 Visible symptoms become evident 3-5 days after infection. 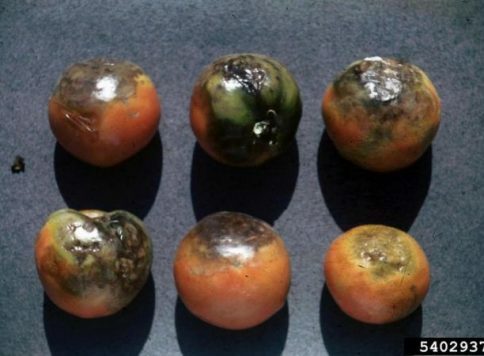 Over winter as spores that exist on remnants of infected plants, fruit and tubers. Maintain good fertility and mineral balance in plants. 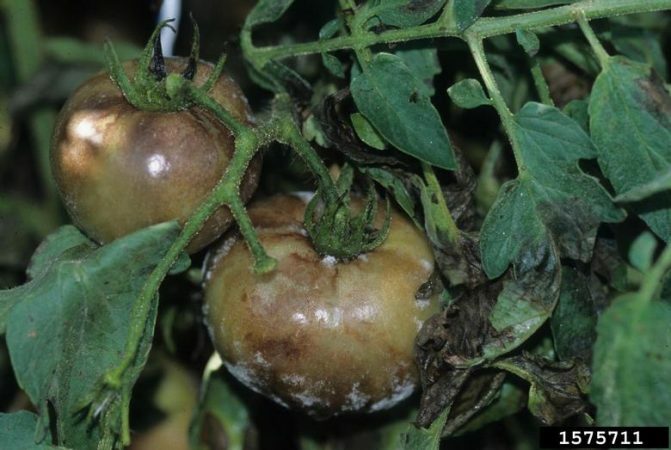 Identify macro- and micro- nutrient deficiencies by performing plant tissue and soil analysis. 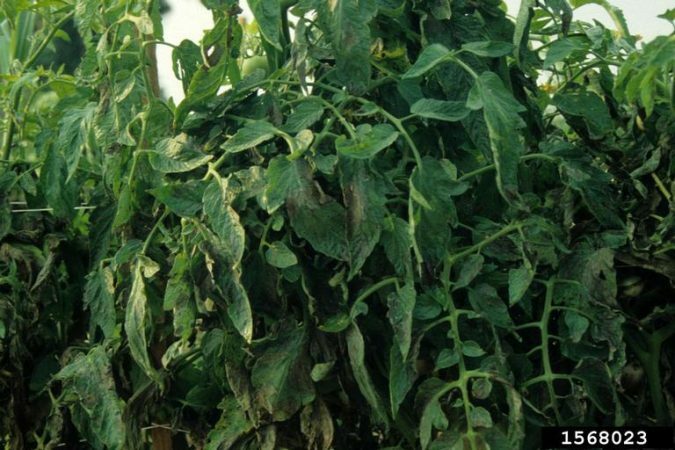 Adjust for deficiencies with foliar and soil applied applications of appropriate fertilizers. 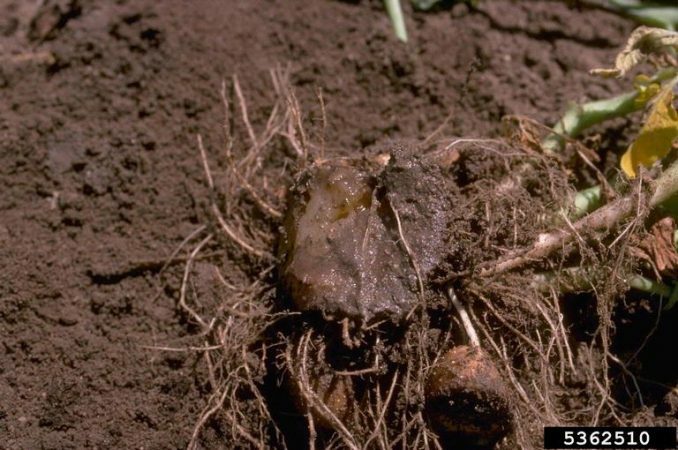 Avoid or minimize factors that contribute to proliferation of inoculation such as: inoculated irrigation tail water from infected fields, dirty machinery, wind, erosion, infected transplants and seed pieces, and mechanical and/or insect root injury. 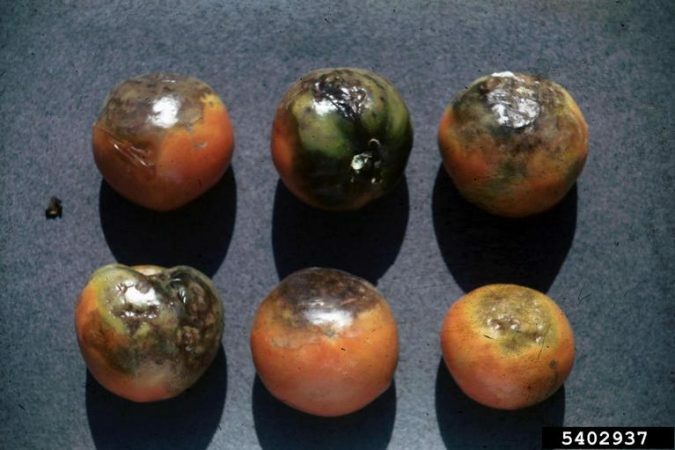 Plant only certified seed and seed pieces free of Phytophthora inoculum. 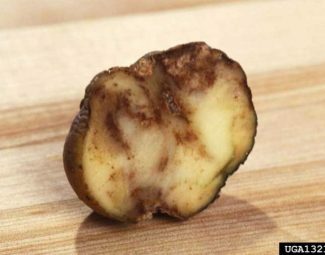 Tubers should be harvested only after they are fully mature and when soil and foliage has completely dried. Avoid over watering and areas of poor drainage. 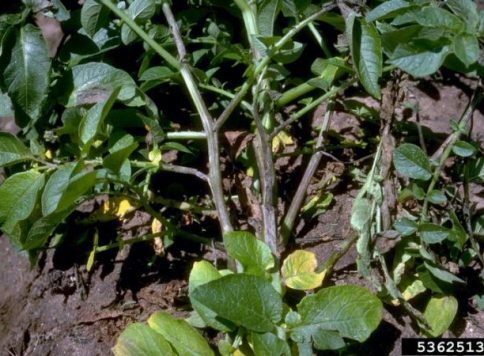 Control weeds that serve as hosts such as petunia, hairy nightshade and black nightshade. 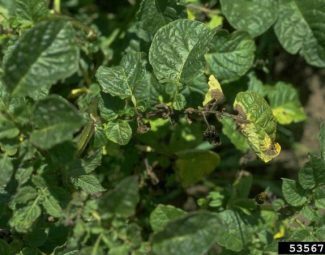 Remove symptomatic plants as soon as they are identified. 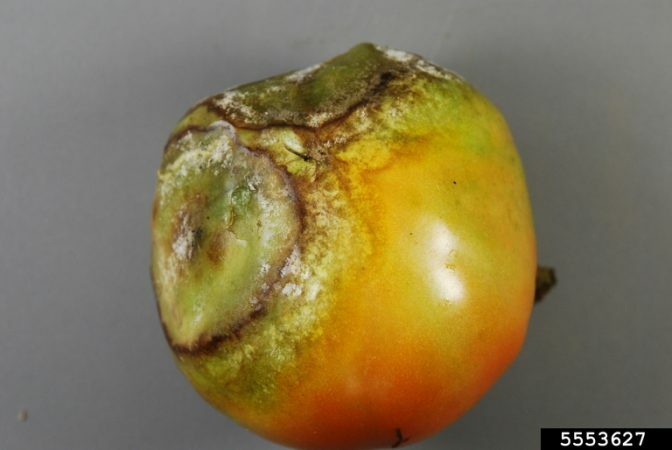 Plant cultivars that have been identified as being resistant to Phytophthora such as Sarpo Mira and Sarpo Axona. 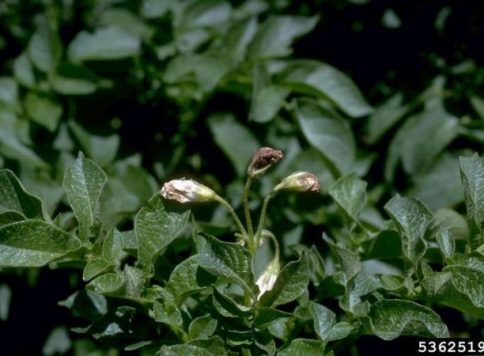 Other varieties rated as moderately resistant include: Abnaki, Belchip, BelRus, Cheiftan, Chippewa, Hudson, Monona, Norchip, Russet, Rural, Superior, and Wauseon. 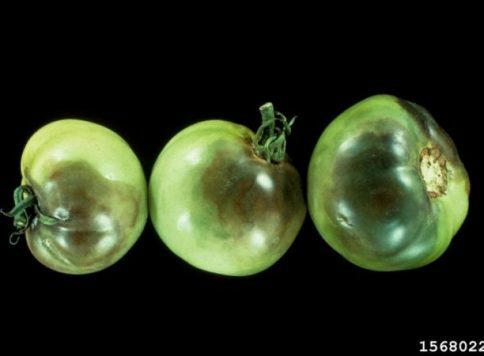 Avoid planting early and late maturing cultivars in the same field. 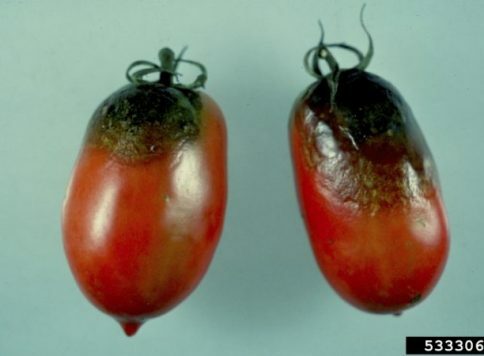 Under this scenario, one cultivar will serve as inoculant for the other. 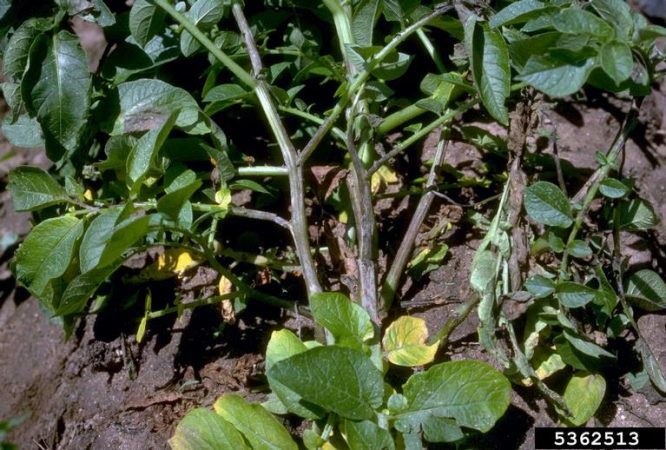 Destroy crop residue immediately after harvest. 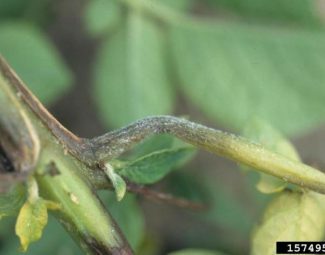 Plowing or disking under residue will enhance breakdown of organic matter that serves as food source for Alternaria. 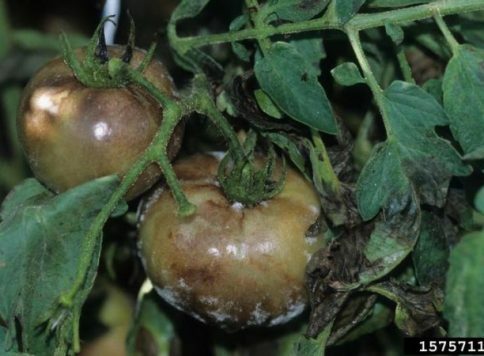 Rotate to immune crops in areas of severe outbreaks for at least 2-3 years. Plant in raised beds and apply layer of mulch to provide hindrance to direct inoculation of soil from foliage to soil. Remove infected tubers from storage when identified.